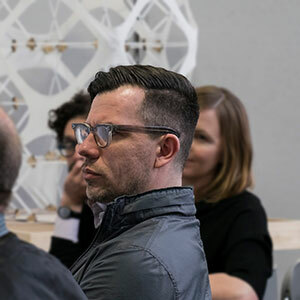 Filip Tejchman is Assistant Professor at the University of Wisconsin-Milwaukee School of Architecture and Urban Planning, and the principal of Untitled Office, a collaborative design practice based in Milwaukee, Wisconsin and Brooklyn, New York. He received his Bachelor of Architecture from the California Polytechnic State University at San Luis Obispo and his Masters of Science in Advanced Architectural Design from Columbia University in the City of New York. Upon completing his studies at Columbia University, Tejchman joined the offices of Liz Diller and Ricardo Scofidio, where he was a member of the design team responsible for the redevelopment and transformation of the Lincoln Center for Performing Arts and The Juilliard School. In 2009, his work on the research and development of the back-lit acoustic surfaces at Alice Tully Hall received a Progressive Architecture award. Following his time at Diller+ScofidioRenfro, Tejchman worked for Joel Sanders Architects where he was a project manager responsible for the design of several award-winning and internationally recognized projects. Among these was the Mix-House, conceived in collaboration with sound artist Ben Rubin and exhibited at the Vitra Design Museum in Essen Germany. Tejchman has taught and lectured extensively in the undergraduate and graduate architectural design programs at the Pratt Institute, Parsons/New School of Design, Columbia University and Massachusetts Institute of Technology. Prior to joining the faculty at UWM, he was the inaugural SARUP Fellow in Design and Innovation. His writing has appeared in the Praxis Journal of Writing and Building, Volume37, and MUSEO. He has also contributed essays to several monographs and exhibition catalogs.